24-May-14 Thailand is in danger of losing its position as the world's top destination for medical tourism if foreign patients looking for low-cost, quality healthcare are scared off by the ongoing political unrest, especially at a time of growing competition from Korea and the Philippines. 20-Apr-14 Faced with higher claims, many health insurance companies in Malaysia are increasing their charges and premiums by up to 20%, as private medical costs increase by up to a government-imposed ceiling of 14%. Medical and health insurance is projected to grow as demand increases in line with the country’s development as a medical hub. 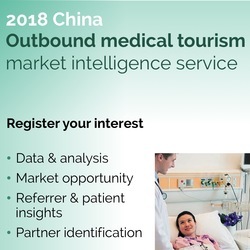 1-Apr-14 Global Growth Markets management and analysts will be at the China Medical Equipment Fair in Shenzhen, 17-20th April 2014. If you would like a private presentation of some of our latest research findings, or to discuss how we can help you expand your business, contact us now to book a meeting. 21-Mar-14 Korea has announced plans to become one of the top seven countries in the global medical device sector by 2020. This is reminiscent of the country's plan about 15 years ago to become one of the top three in mobile phones within ten years. It happened! Expect to see a lot more from Korean med tech firms in international markets. 10-Feb-14 The World Health Organisation lauded the Philippine e-Health Strategic Framework, saying it pushes the Philippines way ahead of many other countries. The access issue is absolutely critical. Having an IT system that has at the core of it a telemedicine concept will be a way forward to be able to access remote and rural communities.